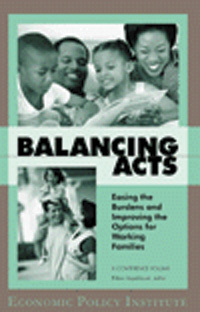 The Balancing Acts symposium, held in Washington, D.C. in late spring 1999, brought together key experts from the research, labor, and business communities to discuss findings and trends in the area of work and family life. In their presentations, included in this volume, researchers shared the results of cutting-edge studies in which they are engaged, while practitioners shared the latest information about the work/life policies and practices firms are implementing and the innovative contracts unions are negotiating. The symposium was sponsored by the Economic Policy Institute, the Alfred P. Sloan Foundation Program on Working Families, and the U.S. Department of Labor Workforce / Workplace of the Future Project.